Whisk together the buttermilk, rum, sugar and eggs until smooth. Place sliced bread in rimmed baking sheets in a single layer. Pour the liquid over the bread. Let soak 30 seconds then flip, taking care that both sides are fully coated in batter. Allow to sit 5 minutes. Melt butter in a large skillet, fry (in batches) the bread on both sides until golden. My love of milk (and buttermilk!) delivery continues with yet another recipe I came up with to use up buttermilk. I can't resist buying those beautiful 1/2 gallon glass bottles! Pain Perdu is sort of a dressed up French toast. You make a sort of custard and soak the bread in it verses just dipping the bread in egg batter. I used some country white bread from a big, round loaf but French bread works too. I topped mine off with a bit of butter and a drizzle of my beloved hickory syrup. 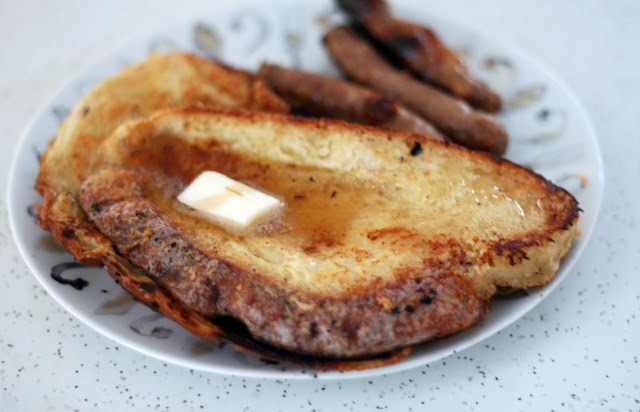 I don't love regular French toast but pain perdu gets a big thumbs up, it is richer and creamer without being heavy. The bread almost gets a pudding texture inside while remaining crisp on the outside.